Top 10 Artificial Intelligence Solution Providers - 2018 | Potentia Analytics Inc. The espousal of artificial intelligence (AI) in healthcare is on the rise and solving a variety of issues for patients, care providers, and the industry as a whole. From designing treatment plans through assistance in repetitive jobs to supervising medication or creating drugs, AI is bringing a paradigm shift to healthcare. The most evident implementation of AI in healthcare is data management—collecting, storing, normalizing, and tracing the lineage of medical records to provide clinicians with literally all the information they need to make viable decisions. Into the bargain, artificial intelligence is also envisioned to make a huge impact on precision medicine and genomics. Mutations and linkages to diseases can now be pursued by identifying patterns in large data sets of genetic information and medical records. A fresh batch of computational technologies is underway, embodying the capacity to detect what will happen within a cell when DNA is altered by genetic variation—be it natural or therapeutic. Meanwhile, AI is even powering a serious debate on whether machines will eventually replace human physicians in the future. While the answer to this is yet to unfold, AI is definitely fostering better clinical decision making while also serving as an alternative for human judgment in specific functional areas of healthcare such as radiology. Companies striving to mount higher in the healthcare value chain look for the best solution providers. To help CIOs navigate this flourishing landscape, a distinguished panel of selectors, consisting of CEOs, CIOs, VCs, industry analysts, and Healthcare Tech Outlook’s editorial board has shortlisted the top artificial intelligence solution providers that are at the forefront of meeting the urgent needs of the industry. The listing offers a look at how these solutions are put to use, thereby enabling you to gain a deep insight as to how they will optimize businesses. 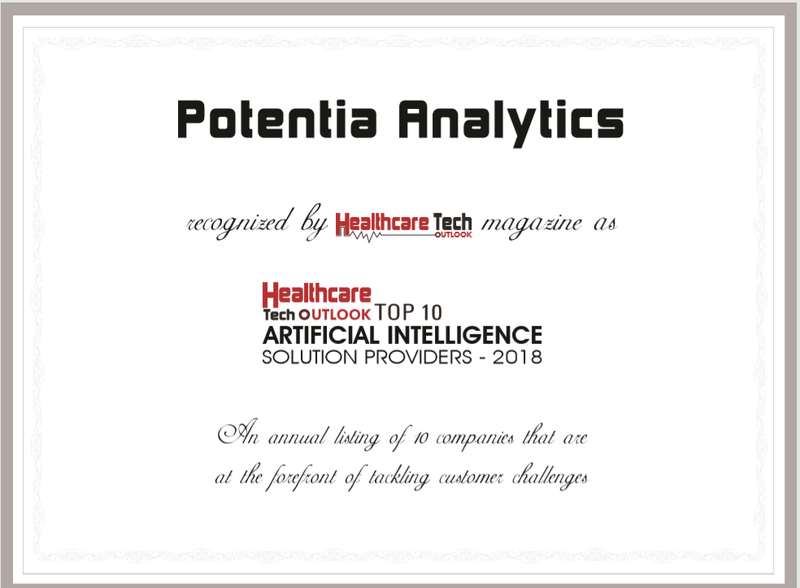 We present to you Healthcare Tech Outlook’s Top 10 Artificial Intelligence Solution Providers – 2018. In recent years, healthcare has undergone a radical transformation from paper records to large data management systems. Healthcare informatics is embracing cutting-edge technologies, such as Artificial Intelligence (AI) which imitates human cognition, to analyze and draw conclusions from vast and complex information. A leader in this revolution is Potentia Analytics, who brings the core trends of AI to healthcare management enhancing the quality of service while decreasing costs. The company offers a range of products, such as Symphony and Bernoulli, which can be used as standalone modules or combined into an inclusive package to fulfill clients’ needs. Symphony is an intelligent provider scheduling software solution that leverages AI and other cutting-edge technologies to facilitate the scheduling of physicians, nurses, and other staff in a fraction of the time versus traditional methods. Using configurable site, business and fairness rules combined with providers’ preferences, Symphony’s auto-scheduling algorithm generates hundreds of possible schedules via Monte Carlo method in just minutes. The user is presented with the best schedule based on computed fitness values of all generated schedules. Additional features include open shift management, time and attendance tracking, and fully customizable analytic reports. “Our solution gives leadership complete control, empowers the scheduling team, and saves valuable time enabling schedulers to build stronger relationships with providers,” says Berardino E. Baratta, CEO, Potentia Analytics. Adding value to Symphony is Bernoulli, Potentia Analytics’ latest tool that draws on stochastic flow diagrams, queuing theory, and Poisson distributions to optimize the flow of patients through an Emergency Department (ED) to reduce cost and maximize resource utilization. All phases of the ED from arrival to disposition are modeled including all resources— physicians, APPs, nurses, cleaning staff, beds, and so on. “Through modeling, users can quickly predict the outcome of changes including length of stay, left without being seen, wait-times, and more. ED leadership can then analyze the results to determine which changes will be most impactful,” Baratta notes. Potentia Analytics sees a near future where Symphony, Bernoulli and hospital Electronic Health Records (EHR) are integrated using open APIs. Symphony would recommend to schedulers a list of providers based on their MACRA MIPS performance scores for each shift’s patient profiles. For example, if an evening shift has a large percentage of high acuity patients, Dr. Gupta would be recommended because of her ability to quickly diagnose and treat such patients with lower readmission rates. Dr. Shahram Rahimi, Co-founder and CTO, Potentia Analytics adds, “Bernoulli will use machine learning techniques and data mining on the EHR data to automatically build and refine in realtime, a hospital’s model to continuously recommend efficiency improvements.” Potentia Analytics’ strong academic connection to Southern Illinois University, a leading research institution, is a key differentiating factor. “We leverage our mix of academic and commercial talent to provide our clients with optimal strategies to help them reach their goals with minimal cost. Our focus is to accelerate the transfer of scientific innovations, such as Natural Language Processing, Game Theory and Deep Learning, from academia to the healthcare industry,” highlights Rahimi. Currently, the team at Potentia Analytics is bracing up to launch their next generation of automatic scheduling that uses genetic algorithms and other sophisticated techniques along with expanded preferences and rule choices. Generated schedules will increase provider satisfaction by further optimizing and balancing personal preferences with business rules. On the investment front, the company plans to grow its sales and marketing capabilities and expand Symphony’s workforce management features, accelerating towards its vision of a fully integrated healthcare solution.